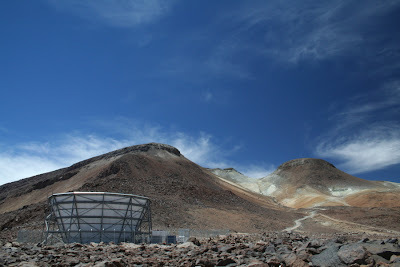 One of the attractions of this location is that we can drive from San Pedro to our telescope, which is at an altitude of 5200 metres (17060 ft), in less than an hour. Though much at the site is still familiar to me, there have been changes in our facilities—the addition of a workshop and some shipping containers, but most notably the installation of a new camera in the telescope with which we hope to begin observing immanently. My time here has thus been a great opportunity to catch up with the project. Many people imagine the work of scientists to be cerebral and esoteric. Indeed, the scientific goals of our project—to study the early universe and discover distant clusters of galaxies—are exciting and lofty. But the fact is that much of the real progress in science is a result of hard work. These past few weeks have been a tangible reminder of this. 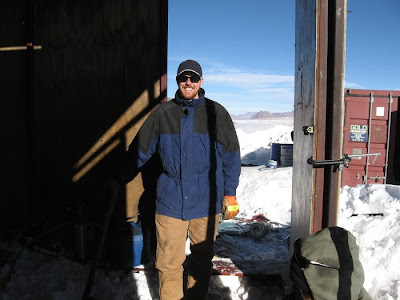 When we finally made it to our observatory a couple of days after I arrived, we found that snow had drifted six feet deep inside our generator shed. There was nothing for it but to dig, which we did for two full days—a tiring task when the amount of oxygen is half that at sea level. One moves a few shovelfuls, and then leans on the shovel to catch one’s breath; one takes frequent breaks. When we got the generator running again, there was more snow inside the telescope itself to be dealt with, equipment to be turned back on and software bugs to be fixed. We have had to bring up our diesel for the generators from the petrol station in drums in the back of our pickup while we wait for a truck to make a big delivery. The days have been long but mostly satisfying. When it comes down to it, this sort of experience is like many things in life. Whether it be a relationship, a career or progress in the spiritual life, anything worth doing requires effort—sometimes tedious, sometimes difficult, sometimes rewarding. The important thing is to keep an eye on the goal, for though there can be pleasure in the work itself, it is secondary. Ultimately, we are meant to be contemplatives, that is, to enjoy things: pondering new scientific knowledge, delighting in a lover, appreciating natural beauty and ultimately and most importantly, loving God. Today I leave Chile and to return to Vancouver, where, in addition to my involvement with ACT, I will be working on a brand new project, the Canadian Hydrogen Intensity Mapping Experiment (CHIME). Doubtless it will also involve rolling up my sleeves and getting down to business. I’m confident it will be worth it, and that there will be much enjoyment in both its execution and its end—ad majorem Dei gloriam. Just read your Wonders of the Universe article dated back in May, then this blog. Love your quotes of the psalms addressing the "Divine Artist"
And when my friend from my university days in Manitoba asked me the first time I visited her on her farm after 30 years "What would you like to do here? " My immediate answer was "Gaze at the stars (in the Prairie sky)!" Glad to hear that you take advantage to see the stars when you can! You might be interested to hear that the telescope I wrote about above was actually constructed and tested in Port Coquitlam before it was shipped down to Chile.